Be the first to share your favorite memory, photo or story of Timothy (Tim). This memorial page is dedicated for family, friends and future generations to celebrate the life of their loved one. Timothy John (Tim) Murray, 68, of Great Falls passed away on November 22, 2018. There will be a memorial service at 2:00 p.m. on Wednesday, November 28, 2018 with visitation at 1:00 p.m. at Hillcrest Lawn Memorial Chapel, 1410 13th St S. The Burial will be at Highland Soldiers plot following the service. Tim was born April 18, 1950 in Great Falls, the youngest of seven children to James and Dorothy Murray. He attended St. Thomas Grade School and Great Falls High School. He served in the Army in Germany and Vietnam, returning to Missoula to further his education. After his accident he returned to Great Falls doing yard work and snow removal. 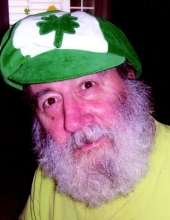 He was proud of his Irish Heritage and enjoyed visiting and helping people. The Soup Kitchen was a favorite. He was a friend of Bill W.
Tim is survived by his son Timothy James; sisters Mary Jo Lacher, Colleen Love, Jackie Strosnider, and brother Mike Murray; brothers-in-law Mike Strosnider, Bob Majerus, many nieces and nephews and a special friend Courtney. He was preceded in death by his parents and sisters, Bettie Cornish and Sue Majerus. In lieu of flowers memorials can be made to III Center, 1225 8th Ave N in Great Falls, MT. To plant a tree in memory of Timothy (Tim) John Murray, please visit our Tribute Store. "Email Address" would like to share the life celebration of Timothy (Tim) John Murray. Click on the "link" to go to share a favorite memory or leave a condolence message for the family.